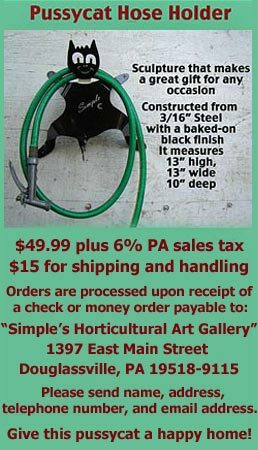 Orders and commissions are processed upon receipt of check or money order (including 6 percent sales tax for Pennsylvania residents) payable to: "Simple's Horticultural Art Gallery." Pickup is by appointment only. To schedule an appointment e-mail Simple@SimpleGardenArt.com. This handsome card, when folded, displays only the bulb in the soil. When the first fold is opened, the foliage appears; when the second fold is opened, the flower is in full bloom. A single packet of 8 cards and 8 envelopes, with shipping and handling included, is $18. A box containing 12 packets of 8 cards and 8 envelopes is $120, with shipping and handling included. Great for gardens and indoor uses, too! These lovely wands reflect sunlight, headlights, Christmas lights, and all other light sources. $25 per foot of sequins. Colors available: gold, red, sky blue, dark blue, and green. Available in one- and two-foot lengths. Sequins are wrapped on 3’, 4’, or 5’ – 3/8” black-painted rods. One foot of sequins on rods, $30. Two feet of sequins on rods, $55. Prices do not include associated shipping costs.